Back in July Paxorion posted a review of the Preppin’ Weapon. I was suspicious that any sanding block could be worth $21.95, but he gave it such high praise, and I was frustrated enough with what I was working with, that I thought I’d give it a try. This thing is great. I even sometimes reach for it when I might have grabbed my ROS in the past. I like the solid way it holds the sandpaper, the comfortable grip. the very even way it sands. I even waste less sandpaper because I’m able to tear off the precise size of the sheets and use them until their worn out. Buy one—you’ll thank me after 10 minutes. Thanks for the review. 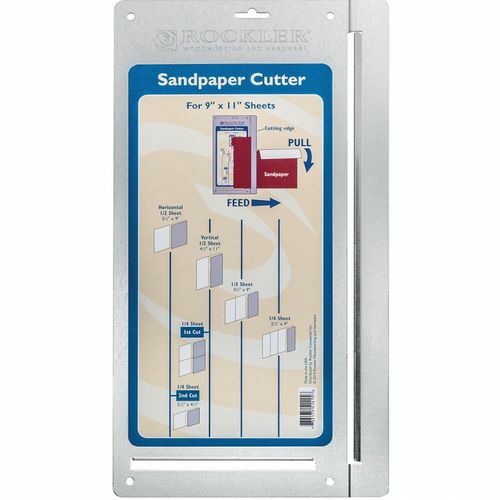 Do you cut strips from full sized sand paper, or do they come pre-cut? I just fold over a strip that fits the sander from a full size piece of sandpaper and then tear it off. So how many minutes did it take for you to thank me Charles? I “saw” this post coming! It took me 6 days to post a thanks in a reply to your review, but that includes the time it took to order it and receive it. Thanks again. When I bought mine, it took 10 seconds to think “why didn’t I do this sooner!” But I think it took me 6 days to get to using it? I think the price for such a simple tool makes it seem like a luxury item, almost. But it’s worth it. I’m making a bunch of earring racks for Christmas gifts. In the past, I would have been tempted to use the ROS, a task for which it is completely unsuited. But now I just use the Preppin’ Weapon (I really don’t like the cutesy name) and all is good. I have to admit I’m tempted, as some have done, to buy a couple more for different grits, but so far spending another $45 to $70 keeps me at one. So I google ROS and git Robot Operating System (ROS) hmmmm..
-- "Ya but what does he know anyhow?" Okay . . . if I had a robot doing my sanding, I don’t think I’d need the Preppin’ Weapon. ROS, in case that is confusing, is random orbital sander. Okay . . . if I had a robot doing my sanding, I don t think I d need the Preppin Weapon. I think the price for such a simple tool makes it seem like a luxury item, almost. But it s worth it. I m making a bunch of earring racks for Christmas gifts. In the past, I would have been tempted to use the ROS, a task for which it is completely unsuited. But now I just use the Preppin Weapon (I really don t like the cutesy name) and all is good. I have to admit I m tempted, as some have done, to buy a couple more for different grits, but so far spending another $45 to $70 keeps me at one. Having multiples is worth it. I’ve got one of each color, “normal” grit marked on them with a Sharpie, loaded with sandpaper. I just take ‘em out of the corral, use it and put it back, grab the next one if needed, use it, repeat. This is my corral. I bought two of them. Well worth it. It feels like part of your body. I have been using a product called the Sand Devil. It uses 3×21” belts instead of torn sand paper. The belts are easily reusable, extremely long lasting and economical. It’s very comfortable to hold and it’s configuration allows it to get into small spaces easily, yet it is also great for sanding large flat surfaces too. You can off set the belt and easily and effectively sand inside corners ( see the video on you tube). I bought mine a few years ago from peach tree woodworking. It has been reviewed on this forum in the past and received 5 stars which I completely agree with.